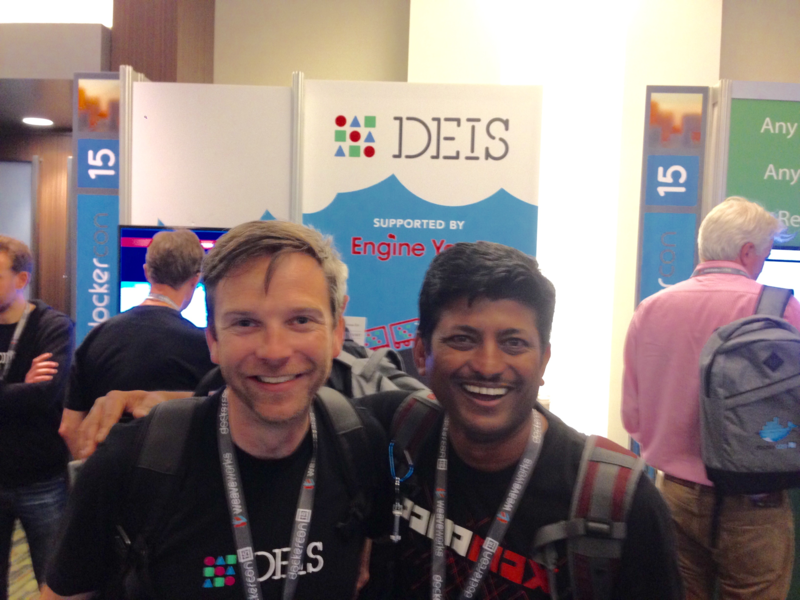 It was an exciting time for us again to be attending DockerCon 2015 this year. 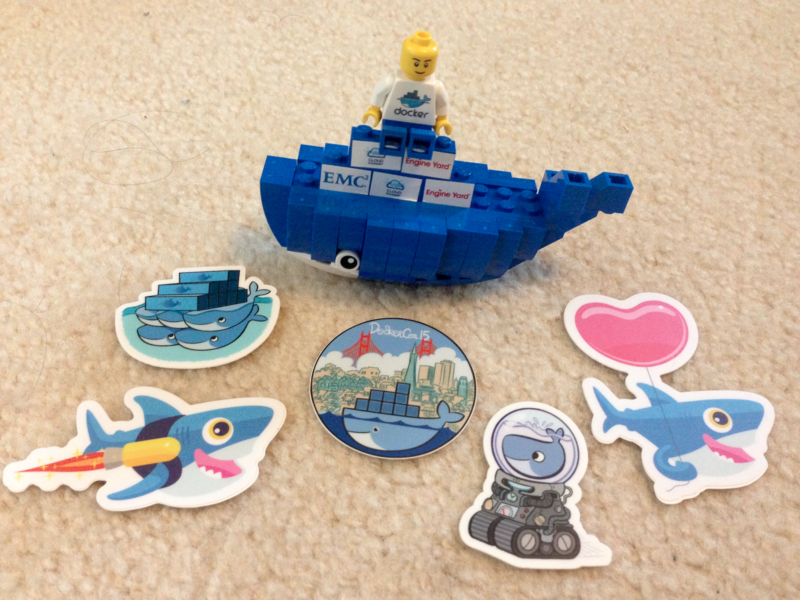 It was the 2nd DockerCon, and was way bigger than the first one. Our whole CenturyLink Labs team was there, excited to hear the new announcements from Docker and the rest of the community. The opening keynote by Ben Golub, CEO of Docker, was followed by Docker’s Founder & CTO, Solomon Hykes. The keynote session was followed by a variety of breakout tracks taking place throughout the day. We attended numerous sessions, met with a multitude of vendors, and talked to a ton of people. Whew, what a day. Our weary brains needed all the rest we could get for Day 2. I awoke on Day 2 before my alarm went off, already energized without even a cup of coffee. What a day! It started out with a bang and added even more highlights to our already amazing conference experience. We got the chance to catch-up with Solomon Hykes, Evan Hazlett and the Kitematic team. 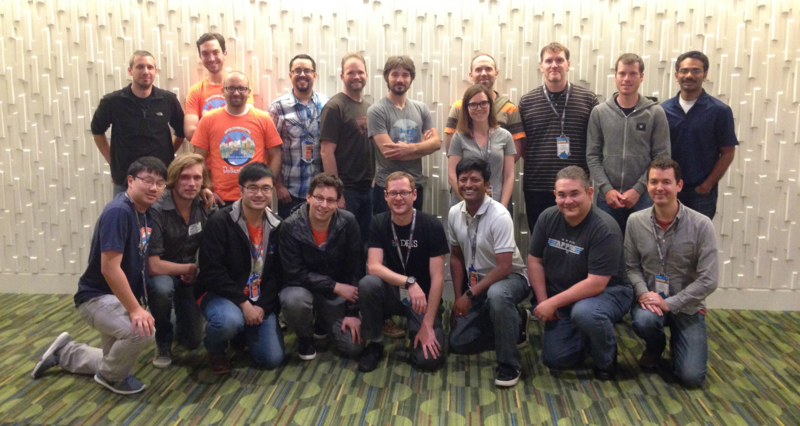 It was great to finally meet some of the Docker team members and chat face-to-face. We were excited to hear more details about the various announcements mentioned during the Day 1 Keynote, and were especially stoked to see our very own Lorry.io project mentioned in the “Thank You to the Ecosystem” slide. 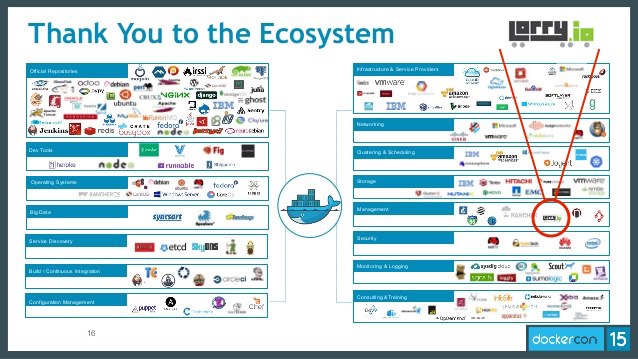 Ben Golub shared more insight into Docker’s incredible growth stats and ever increasing enterprise adoption trends for Docker. Solomon Hykes opened with big emphasis on “Mass Innovation”, with a shoutout to the developer community to help “build a software layer to make the Internet programmable”. 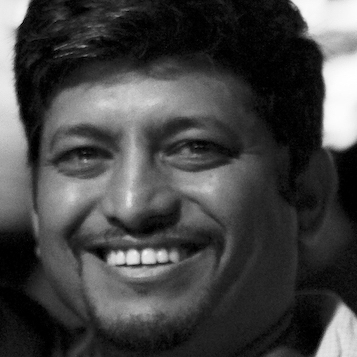 He evangelized on “Incremental Revolution”, and listed out Docker Container Runtime, Docker Distribution Tools, Docker Compose, Docker Machine, and Docker Swarm as key components in the Docker tool chain. The key announcements from my perspective included: Docker Experimental releases and the acquisition of SocketPlane, leading up to the new, much awaited, Docker Network, finally providing multi-host networking out of the box. Docker Plugins, was next to be introduced with extension points for network, volume, scheduler and service discovery plugins. Then Docker Plumbing Projects was introduced, including announcements for Notary, Open Container Format (OCF, an universal intermediary format for OS containers) along with the Open Container Project, and runC (the universal container runtime), being an OCF reference implementation. A lot of updates to Engine, Compose, Swarm and Machine were announced as part of the next Docker 1.7 release. Deepak Singh from AWS, announced that the EC2 Container Service will be fully integrated providing native Docker Compose experience, later this year. Docker Hub 2.0 (beta) was announced, featuring a new UI and improved performance, along with the next iterations of Registry 2.0 and Automated Builds v2. The Docker Trusted Registry (beta launched in February as Docker Hub Enterprise), with an eye towards the enterprise customers, was also announced. Last but not the least, Evan Hazlett, showcased “Project Orca”, a top-to-bottom integrated stack for Operations teams, providing an integration of Swarm, Machine and Compose to provide a seamless Run experience. There were so many sessions that it was hard to attend all of them, but Docker has made quite a few resources from the conference publicly available. 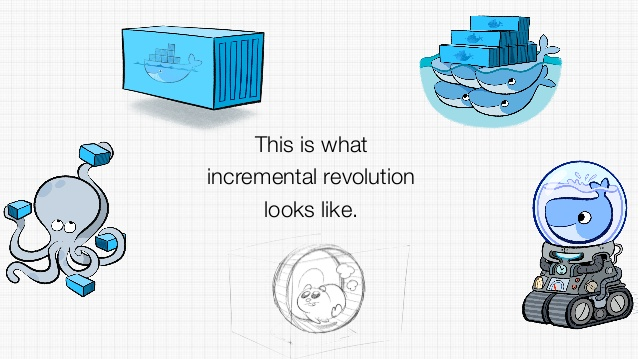 Slides and videos of Day 1 and Day 2 from all the sessions at DockerCon 2015 were shared. 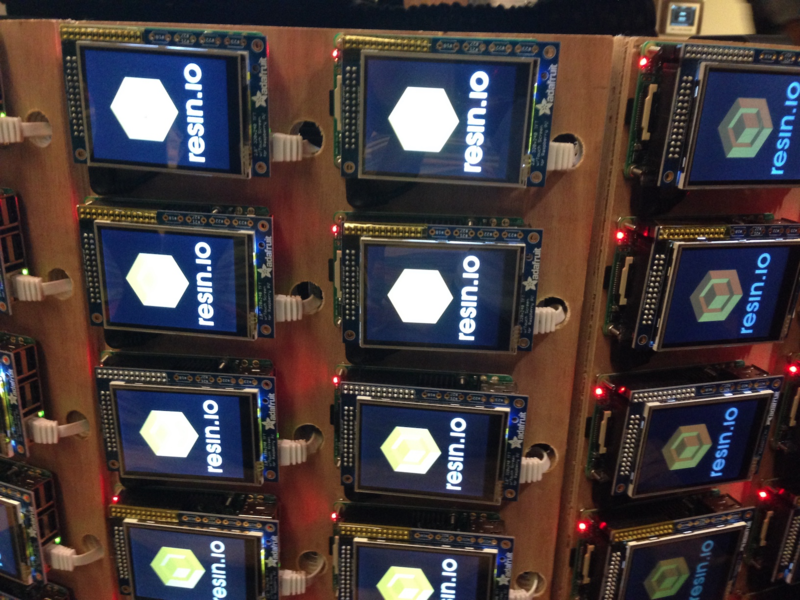 Docker also posted a roundup of DockerCon 2015 Day 1 and Day 2. 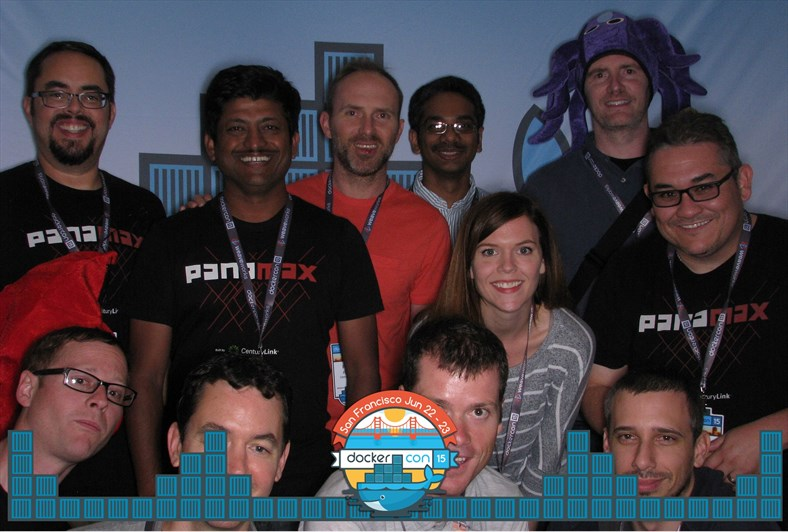 Overall, it was an amazing conference with great announcements from Docker and the various vendors. I’d love to hear what your favorite session, speaker or announcement was — please share in the comments below.